I needed to go to Sevenoaks to pick up a few fish for our aquarium; I decided to look for a Sunday lunch in Otford, which is very close to Sevenoaks in Kent. After a bit of searching, I settled on The Horns. After a quick call, our booking was set for 2 people at 12:30. We drove through some marvellous scenery to get to Otford, there was a roundabout with an amazing pond at the top of the High Street. A very pretty village indeed. The Horns were placed just down the High Street, a precariously narrow road with lots of stopping and starting, letting other cars through. We parked up in the small car park behind the restaurant (there was also some parking spaces in front of The Horns). The building reminded me of Tudor styling, with white walls and black beams. As soon as we walked through the door, we were met by someone who showed us to our table. Unfortunately, this was right in front of the door, but they moved the table a foot or so away from the entrance. They also put some extra logs on the wood burning stove (and opened the doors) to create some more warmth. Due to this effort, we weren’t affected during the meal by the door, so thanks! Menus were passed to us, we were asked what we would like to drink – Claire decided on a sparkling water, I had a diet coke. A few minutes later our food order was taken – Claire chose roast beef (requesting it to be well-done), I ordered roast lamb. Looking around the restaurant, it had around 10 groups of tables (ranging from 2 up to 10 per setting). Our table was set out with a thick, red, paper napkin each, as well as two knives and forks (suggesting starters might be an idea). The Tudor styling continued inside, with exposed, black beams and white walls. The aforementioned wood burning stove was behind us (and tended to by the staff throughout the meal). There was a small bar serving area, with lager on tap if requested (I also noticed a bar area around the other side of the building – to get to it, you needed to go outside). With relaxing music on, they had created a relaxing and informal atmosphere to enjoy a Sunday lunch. After just a few minutes, out came some granery rolls with two slices of butter. I always enjoy bread before a Sunday lunch, as long as it is good quality, and this was very nice! Almost as soon as we finished our bread, the Sunday lunches came out. They looked good – two large slices of meat each, vegetables hiding underneath and, the pièce de résistance, the huge Yorkshire pudding. I had some mint sauce on the side of my plate, Claire had home-made horseradish. The lamb was seasoned well and tasted of good quality. 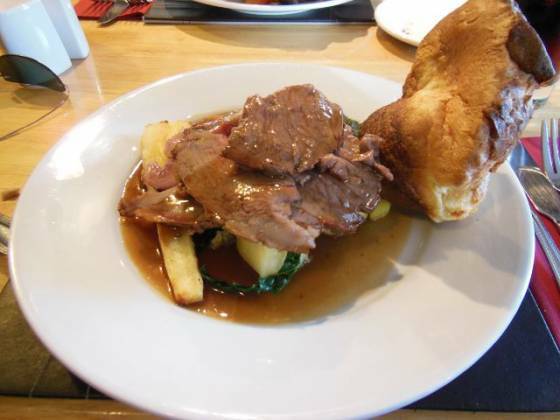 I sampled Claire’s roast beef – whilst it was cooked well-done, I enjoyed it immensely. I counted a few roast potatoes (and had an extra one from Claire’s plate) – most were fairly crunchy and fluffy inside. They were also seasoned with garlic, which gave them a nice taste. I would have preferred them to be more crispy, but they were thoroughly enjoyable. The vegetables consisted of shredded cabbage, roasted parsnips, sliced carrots and I believe some swede; all in all, cooked to perfection. The Yorkshire pudding was (in Claire’s opinion) “crunchy, light, airy yet doughy – almost an oxymoron in itself!” – this is one of the highest accolades from Claire ;-) Lastly, the gravy – good quality and enough to last my main course and one extra potato – the huge Yorkshire pudding did absorb quite a lot of it! Our plates were taken away and pudding menus were brought out. Some interesting options available, such as home made ice cream (including some boozy ones), Willets Farm ice cream (such as peanut butter!) and quince pear and apple crumble. Whilst they all sounded tempting, I had my heart set on a sticky toffee pudding (which they had). We also ordered a decaf coffee for Claire, and I requested a green tea. A few minutes later, out came my dessert. 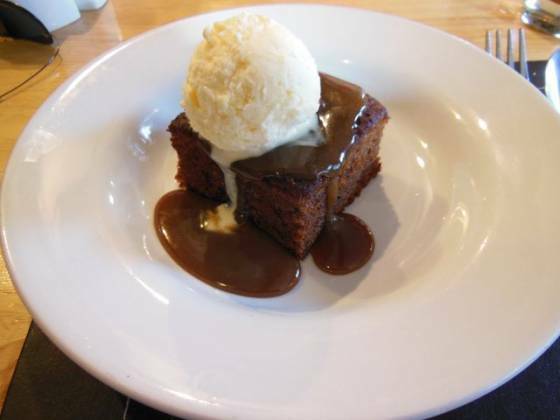 With a large square of sponge, thick toffee sauce and a scoop of ice cream, it looked good. The sponge was airy (almost springy) and not at all dense. The toffee sauce was satisfied my sweet craving, and the ice cream was, well, vanilla ice cream. A very enjoyable dessert. As soon as I finished eating and placing my spoon down, our after dinner drinks were brought out. Claire had a large cup, with milk jug and sugar where as I had a Whittard of Chelsea type tea-cup and saucer for my green tea. After finishing our drinks, I asked for the bill which was swiftly presented – no waiting around etc. All of this, came to £33.85 – excellent value, in my opinion. So, on to my conclusion. I knew the Sunday lunch at The Horns was going to be good, but I didn’t realise how much it seemed like they cared that we had a great experience. The staff were attentive without being pushy. Even as we were leaving, Claire remarked the waiter almost looked disappointed we got to the door before he could get there to open it for us! I was amazed with the timings, the transition between courses and drinks was so smooth – there was not waiting around, yet we didn’t feel rushed. The food quality was excellent, the roast was simple but effective. As mentioned, I would have preferred the roast potatoes being cooked a bit longer, but this wasn’t enough to mark them down at all. The vegetable selection was varied and the Yorkshire pudding was definitely a highlight. With inventive desserts topping off the meal, this was definitely one of our best lunches for a while. Please note, I don’t think this would be suitable for a very young family, this was more for a relaxing lunch with friends or perhaps a celebratory meal. 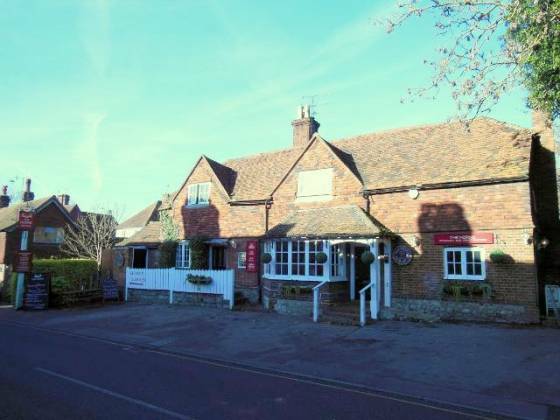 So, Sunday lunch at The Horns in Otford, Sevenoaks lands a well deserved 5 plate score (Top Rated Award)!